If a standard, fixed-configuration kit doesn’t provide the coverage you need, contact us to discuss your exact requirements; we can engineer a solution specifically for your environment. The antenna feeder cable length is longer than the standard 30M available in a kit. The maximum cable length using standard RG58 coaxial cable is approximately 30M due to signal losses through attenuation. We would specify the correct cable for your situation, based on known loss characteristics of a range of available cable types. Cable such as LMR400 or BWL400 is often perfect for the job. If the losses are still too great we can specify a 16dB gain in-line amplifier unit. The repeater system needs to provide coverage in more than one area or room. We have a range of signal splitters and amplifiers that can be engineered into a solution to provide coverage over a wider area, or multiple areas, within a facility. We analyse your situation, taking into account parameters such as cable lengths, physical environment, availability of mains power etc, and provide technical drawings to illustrate the proposed solution. Different specification of GPS antenna needed, e.g. covert, ruggedised, etc. Most times a standard GPS antenna with a built-in 35dB gain Low Nose Amplifier (LNA) is perfect for receiving GPS satellite signals. If a different antenna type is required, for example a small patch antenna or perhaps a highly-ruggedised device, FalTech GPS can recommend a suitable alternative. This system covers the interior of a large industrial unit that is divided into a number of separate laboratories where signal is required. The antenna feeder cable is quite long so an amplifier boosts the signal by 16dB. 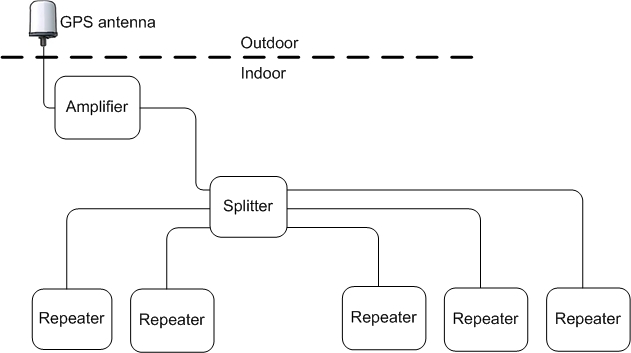 The splitter distributes the incoming signal to up to five repeater units. DC power from one of the repeater units is passed through the coaxial cables to provide power to the amplifier and the antenna. Need help to decide which system is right for you? Licensing of GPS repeaters in the UK. Licensing of GPS repeaters in Canada. Licensing of GPS repeaters in the USA. If you have any queries please drop us a line. Ask for more information about FalTech GPS, our GPS Repeaters and other solutions, please fill out the form below or call us on the number below. * Denotes a required field. We will never pass on your details to any third party organisation. FalTech Limited, 6A Waterside House, Falmouth Road, Penryn, Cornwall, TR10 8BE, United Kingdom.